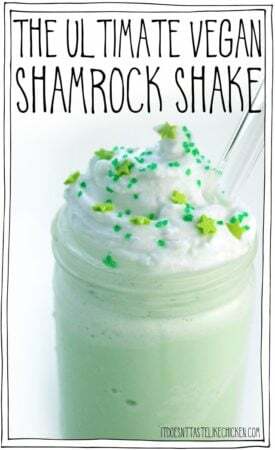 When I asked what recipe my lovely fans on Instagram would like for St. Patrick’s Day, the top vote was a vegan shamrock shake recipe. Really!? I thought. But isn’t that just a simple minty milkshake? Well, yes it is. But then I made it, and then magic happened. And before I knew it, the entire vegan shamrock shake was gone, and there I was trying to noisily slurp up the last few drops with a straw. 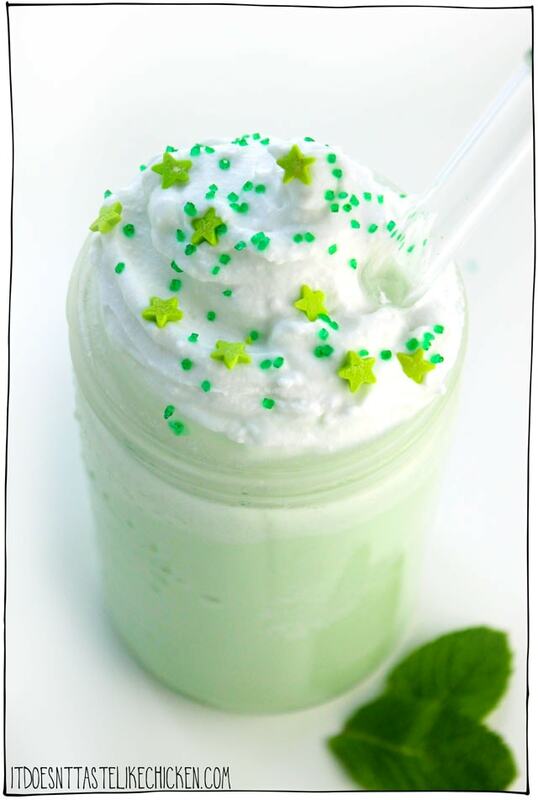 Yes, a shamrock shake is just a minty milkshake, but once I made my own vegan shamrock shake, I quickly learned why everyone was so excited. 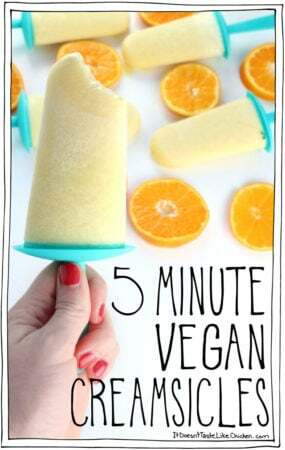 Sometimes simple is best and in the case of this vegan milkshake, it couldn’t be truer! 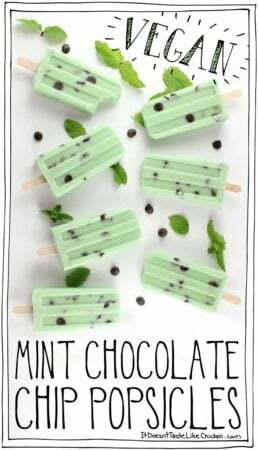 Creamy, rich, lightly sweet, with a minty freshness. It’s the perfect combination of flavours making it the most divine St. Patty’s day treat. 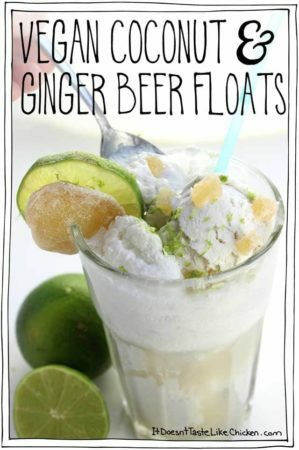 Then, for more fun, you can top the vegan shamrock shake with Coconut Whipped Cream, green sprinkles, fresh mint leaves or a maraschino cherry. So fun and festive! 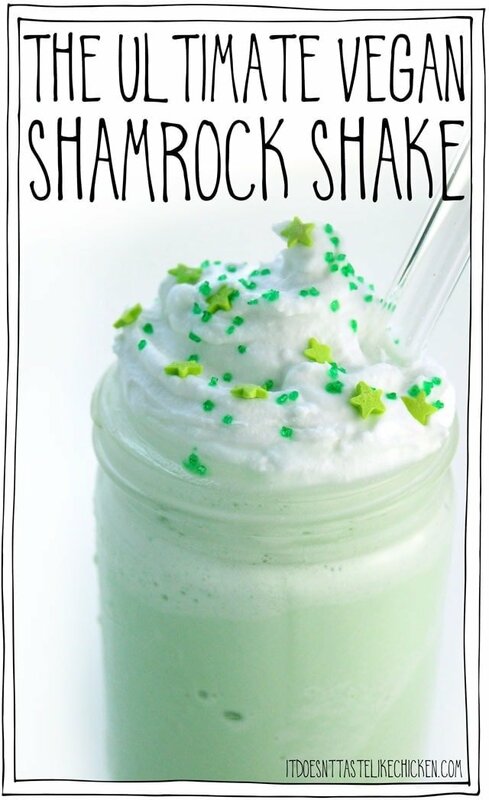 Traditional Shamrock shakes are made with ice cream, and while of course, you can easily buy vegan ice cream, if you know me I am always looking for an easier hack. 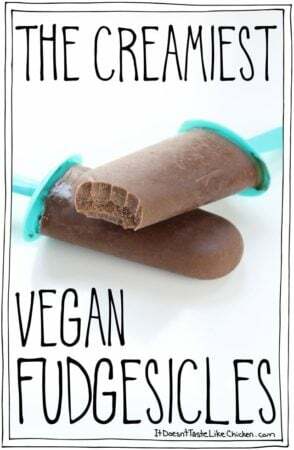 I took inspiration from my Instant Vanilla Ice Cream recipe in Fuss-Free Vegan (page 176), and decided to freeze full-fat coconut milk or Heavenly Heavy Cream (page 206 in Fuss-Free Vegan) for the perfect frozen creaminess. This is not only cheaper, but you can control the sweetness to your own taste preference. 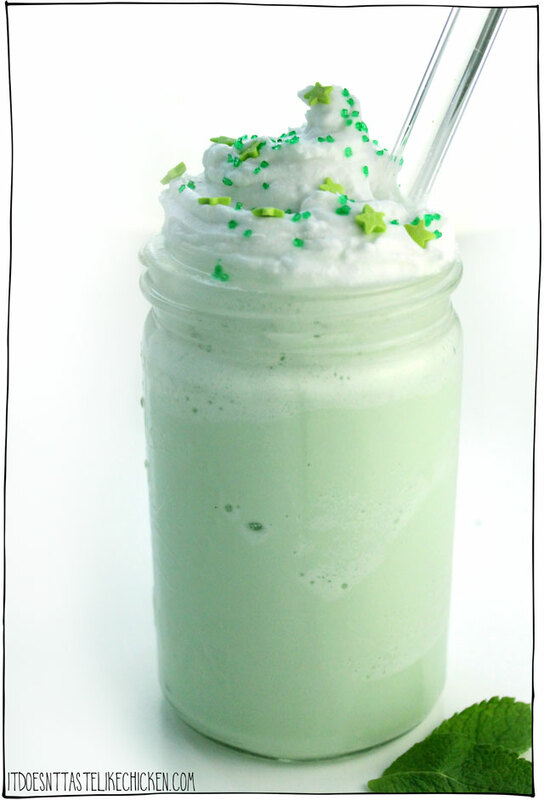 The result, you guessed it, The Ultimate Vegan Shamrock Shake! 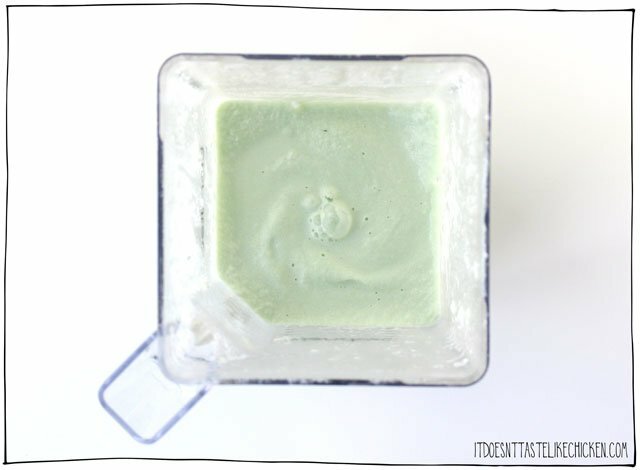 To make The Ultimate Vegan Shamrock Shake: Pour the full-fat coconut milk or Heavenly Heavy Cream into an ice cube tray and freeze overnight. 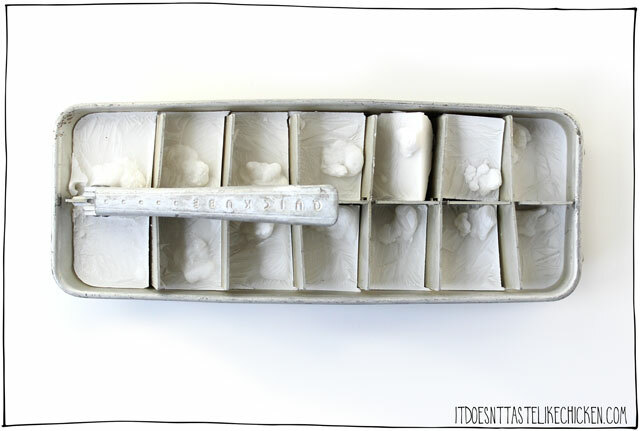 I used this very handy dandy vintage ice cube tray I have, but you can get newer versions of this ice cube tray on Amazon if you desire. Add the frozen cubes to a blender along with the agave, peppermint extract, vanilla extract, and food colouring. Blend until smooth and creamy. Divide among two glasses. Optionally, you can decorate your shakes with any additional toppings. I opted for Coconut Whipped Cream and green sprinkles, because CUTE! 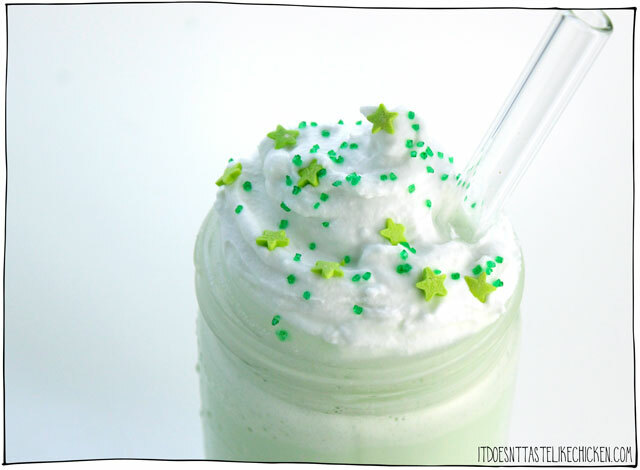 This dairy-free St. Patrick's day dessert is easy to make! Just freeze coconut milk in an ice cube tray and blend with non-dairy milk and some flavourings for a creamy, delicious, mint milkshake. 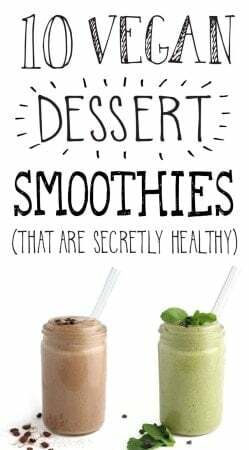 Add the frozen cubes of full-fat coconut milk or Heavenly Heavy Cream to a blender along with the non-dairy milk, agave, peppermint extract, vanilla extract, and food colouring. Blend until smooth and creamy. Divide among two glasses. Optionally, you can decorate your shakes with any additional toppings. Previous Post: « It Doesn’t Taste Like Chicken is hiring! Hi! I have a question regarding your Heavenly Heavy Cream (which I finally made today, YAY, YUM), perhaps this is silly, but can it be whipped? Not sure what properties coconut cream and regular moomoo cow cream have that allow it to fluff up when whisked/beaten while cold. Thanks! Hi! Glad you are enjoying the book. It won’t whip, but you could use less water to make a thicker cream and maybe add a bit of sweetness (similar to the sour cream of my dreams but sweet instead of savoury). Hope that helps! Just made this, and it tastes amazing. The only problem is the consistency. It was more like a slushy than a shake. Any ideas on what I did wrong? Could it have been the fact that my coconut milk was separated before I froze it in an ice cube tray? I’ve got to make this for my husband! He loved shamrock shakes, but hasn’t gotten one in a couple years. 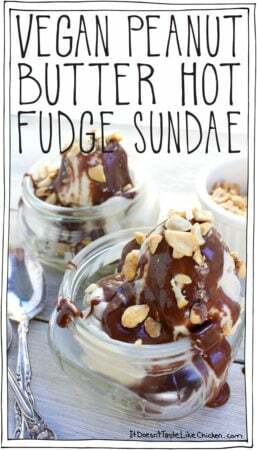 I missed making this last weekend but it will be delicious anytime! 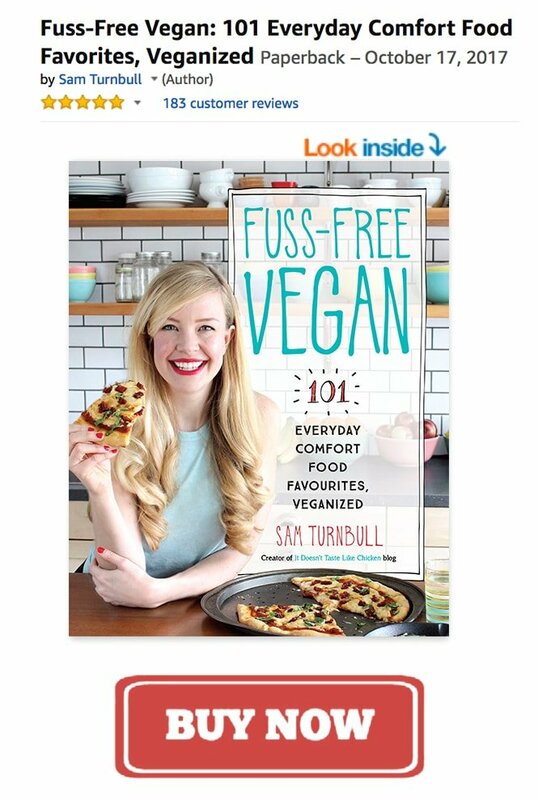 Sam, I have a question about a recipe in Fuss Free Vegan while I’m here. I really want to make the brownies but they need to go in an 8×8 pan. I only have a 9×9. Will that work? Should I just reduce the baking time by 5 minutes or so, or should I just buy the 8×8 pan and wait until I have it to make them? Thanks! Hi Kristi, I hope your husband loves it! Yep, the 9×9 pan should work fine, they will likely take just a little less baking time as you suggested. Enjoy! Sam, this was crazy good! I made it for my husband for St. Patrick’s Day. YUM! I would even omit the added sweetener, as we both found it to be Sa-weet (but in a good way!). These shakes were fantastic! Even my mom-vegan husband gave his a thumbs up! I did find I wanted my shakes colder so I added ice cubes to the recipe. They didn’t compromise the taste a bit. Thanks so much for sharing this delicious recipe. Looks so fresh and minty. 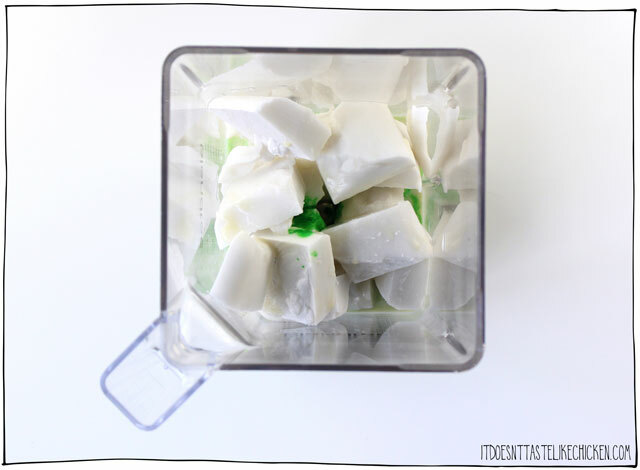 One question, as I’ve never frozen coconut milk: do you shake the can to mix it up before pouring into the cube tray? I’ve seen some recipes where the can is chilled overnight, then opened, and the solids scooped out. Thanks, and great pics as always! Looks delicious! Two question though, would it be okay to supplement the agave nectar with maple syrup? And what vegan food coloring brand(s) do you recommend that I should use? Hi Caramel! You can use maple syrup, it may have a slight maple-y taste so as long as you are ok with that. For food colouring any brand that is vegan-friendly will do. Here’s a good one. Some food colouring, especially red colours, can contain animal ingredients such as carmine which is a red beetle that they crush for colour. Thank you, Sam. It sounds delicious and looks gorgeous, but one small correction – your instructions do not list adding the 1 cup of non-dairy milk. Good catch! It’s all fixed now, thanks, Brandi!